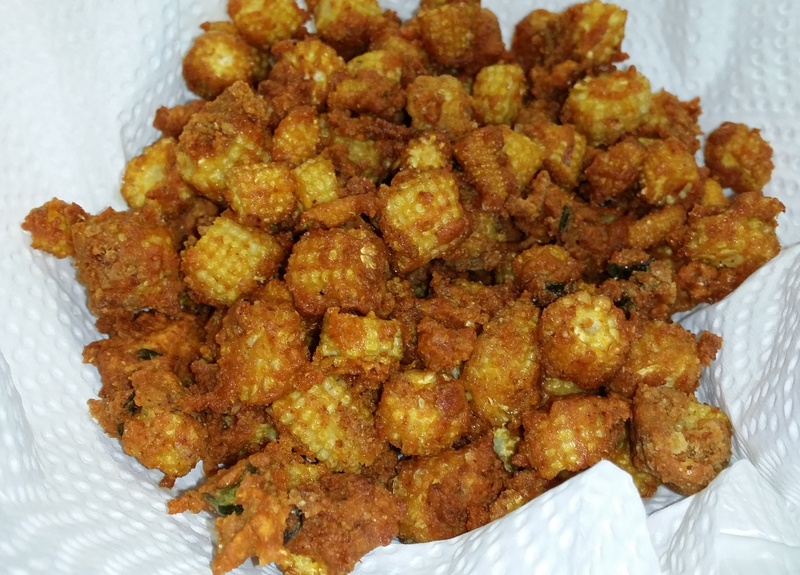 I posted a recipe for baby corn pakoda not too long ago. It was an instant hit and I’ve made it several times now. This afternoon I decided I needed my pakoda fix only to find out that I’ve run out of rice flour. So I tweaked the recipe slightly and guess what? I much prefer this version! It’s crunchier and much spicier. Cut baby corn into small rounds. Boil until tender. Drain well. Mix spices, besan, corn flour and curry leaves. Add boiled baby corn. Mix well, if mixture is too dry, sprinkle a little water. You don’t want a batter, just have enough moisture for the mixture to clump together. Heat oil on high. Drop the baby corn pieces in one by one. With the oil quite hot, they should crisp up very quickly. Scoop out from oil, drain well. Serve hot. Enjoy!